Written by: Joe Walker on March 29, 2019. On certain days, before the sun rises on the Gulf Coast of Mexico, the sandy shores of some beaches can seem almost alive with jostling, lurching movement. On these days, hundreds upon hundreds of hatchling sea turtles make their way to the darkness of the ocean, guided by the faint light of the sun on the horizon. It is estimated that only one in one thousand sea turtle hatchlings ever make it to adulthood; as a species, they face danger from the moment they emerge from the shell. In fact, six of the seven sea turtle species are classified as threatened or endangered. Humans play a large role in the depletion of the sea turtle population. Sea turtle hatchlings use the natural horizon for orientation and can become confused by other sources of light such as beachfront lighting and car headlights. Tellingly, every year thousands of adult sea turtles die after coming into contact with man-made pollution such as plastic waste, oil spills, and land runoff. Sea turtles are also a source of food in certain parts of the world, and black market trading of sea turtle shells has been practiced for centuries. With so many threats to their existence including climate change—which is beginning to affect sea turtle nesting grounds—it’s no wonder that the species has become a talisman for conservation efforts around the globe. 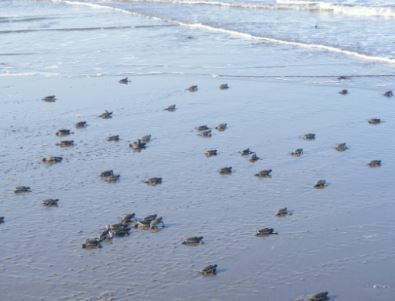 Fundación Yepez A.C. in Veracruz, Mexico, works to protect sea turtles in the region. Of the seven species of sea turtles in the world, five species lay their eggs on the Gulf Coast of Mexico; the Kemp’s Ridley, the Green turtle, the Loggerhead, the Hawksbill, and the Leatherback. The main objective of Fundación Yepez is to preserve the lives of sea turtles. Employees painstakingly patrol around 50 square kilometers of beaches on all-terrain vehicles (ATVs) to look for the nests of sea turtles. If eggs are found, they are returned to headquarters and placed in either incubators or artificial nests. Over the course of 2017-2018, Fundación managed to successfully collect an astounding 1 million eggs and make sure that the hatchlings made it to the water. The work doesn’t stop there. In an effort to educate and inspire the community, Fundación Yepez also organizes projects such as beach clean-ups, recycling drives, and other community events. Locally-based initiatives such as these amplify the impact of the organization’s efforts ensuring that conservation in the region is a sustainable practice and cementing the area as a haven for sea turtles. By combining scientific rehabilitation efforts with grassroots advocacy & education campaigns, Fundación Yepez is making real waves in sea turtle conservation. It’s important to remember that the more we learn about animals at peril, the better equipped we are to tackle conservation efforts across the globe. Sharing information and refining our processes are key to achieving a holistic approach to true sustainability and the health of our oceans. With a majority of the funds from CAF America’s grant going towards purchasing gasoline for Fundación’s ATVs and vehicle maintenance form natural wear and tear, this is a prime example of the paramount importance of small donations contributing to vital functions within charitable organizations. Without this basic level of support, the meticulous and often costly work to allow nonprofits to serve their missions could not be accomplished. In the realm of charitable giving, no amount is too small.